Learn how to make the Best Homemade Laundry Detergent. 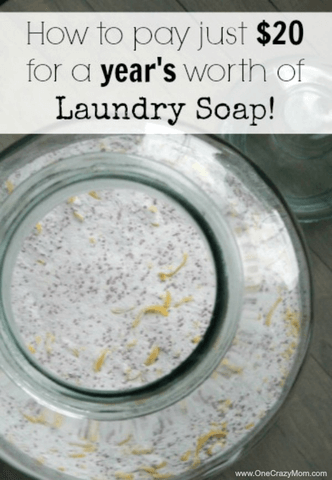 You will be shocked that you can make this for only $20 for an entire year of laundry! 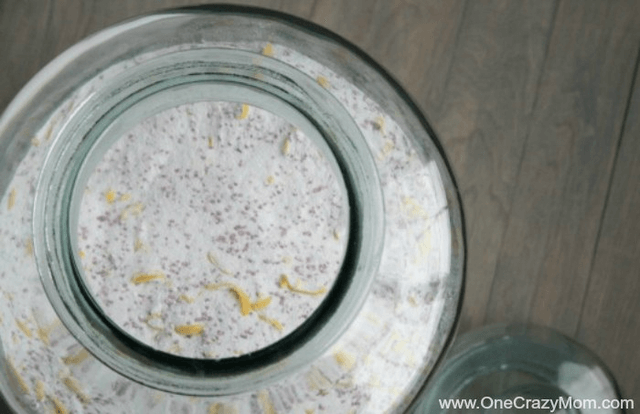 This is the best homemade detergent that will get even the dirtiest clothes clean! If you aren’t one of those people that just LOVES to make everything themselves, then you might not be thinking this post is relevant for you. Let me just tempt you with this – I am going to tell you how to spend only $20 for a year’s worth of laundry detergent! Are you interested now? Let’s talk about how to make Homemade laundry detergent. Keep reading. I thought this would be the perfect post in my House Cleaning Tips and Tricks series. If you have ever looked into Homemade Laundry Detergent, you know there are literally HUNDREDS of “recipes” for making your own! I first started experimenting with my own laundry detergent about a year ago and after 4 different blends of ingredients, I have finally found something that I love! Not only does it working amazing, but this Homemade Laundry Detergent recipe will save you hundreds of dollars each year. You are going to be thrilled with how well this detergent works and how little it costs to make it. Most basic laundry detergents have 3 core ingredients: Borax, Arm & Hammer Washing Soda and laundry bar soap (like Fels-Naptha or Zote). I have incorporated a few more ingredients because we need something that is great at getting stains out AND leaves clothes smelling clean and fresh. Borax is one powerful cleaning agent. I mean… let’s get serious about it for a minute. It is very frugal friendly but has some really nice benefits. It really is a miracle cleaner! Is Homemade laundry detergent safe for washing machines? Yes! These ingredients are all safe and totally fine to use in your washing machine. Your clothes will be so clean and you will save money! Imagine the load of laundry per detergent you can do! The savings will add up quickly. This detergent cleans your clothes very inexpensively. This powder recipe is my absolute favorite recipe for homemade detergent. It will work great for even the dirtiest of clothes. Natural soaps work so good. Nothing compares to homemade laundry soaps. Fels-Naptha Laundry Bar Soap (only $.98 per bar and located in the Laundry soap aisle). If the ingredients are making you nervous…. don’t worry, you can find it all on the Laundry Detergent aisle at your local store or on Amazon by clicking the links above. Is Homemade Laundry Detergent he safe? The first thing many of you may be asking is, “But is it safe for my HE washer?” With absolute certainty I can say yes! Why is it safe? Well, HE washing machines are High Efficiency because they use less water (and energy) to wash your clothes. Since they use less water to wash (and then rinse) the clothes, it needs a detergent that doesn’t suds up like a typical laundry detergent. 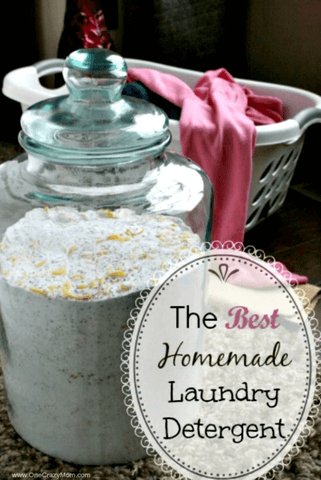 This homemade laundry detergent is VERY low suds! Don’t let that fool you though, this cleans very well, just don’t expect the bubbly soap suds that a typical detergent gives you. So for those of you with HE washers, you will save even more money by making your own laundry detergent. Is Homemade laundry detergent worth It? Another question you’re probably asking is, “Is it really worth my time to make my own detergent?” Again, I say yes, but let’s see the proof. I am going to do a cost breakdown for you so you can see for yourself. Let’s say you are a loyal Tide user. If you use the powder (which is cheaper than the liquid), you will spend about $18 for a big box of powdered detergent (I looked at Walmart prices). This big box will give you 102 loads, so if you do about 10 loads of laundry a week (give or take a few), this Tide will last you about 10 weeks. $18 for about 10 weeks. If you use a different detergent, obviously your price per load would be different but this gives you a general idea. If you are willing to invest about $20 up front, then you will be able to create enough laundry detergent to last you about a year (depending on how many loads you do a week). I bought these items at Crest Foods in Oklahoma, so your prices may vary slightly depending on where you shop. Ok, I don’t want to get into a bunch of crunching numbers with you, but let’s just say this: throwing all of these items together you will have about 287.5 ounces of powdered detergent. YES, this is VERY heavy (nearly 18 pounds plus the weight of your container). It only takes 1-2 tablespoons per loads to get your clothes nice and clean. So… using only one tablespoon per load would give you 575 loads!! If you do about 10 loads a week (yours may be more or less), then you will be able to do laundry for about 57 weeks – that’s more than A YEAR! How to grate bar soap for Homemade Laundry detergent. Grate the soap? You heard right. The Fels-Naptha laundry soap is a bar and in order for you to get a little bit in every load, you need to grate it. Simple enough, right? Well, let me give you a few words of advice. Speaking of clean up – do NOT put your grater (or food processor blades) into the dish washer to clean up! Warm soap and water and a little time will work just fine. In the dishwasher the film from the grated soap spreads to every single dish in your dishwasher and will take several loads to make them clean again. One more tip – I noticed that when I took my cheese grater straight from the dishwasher, still warm, the soap grated quickly and easily. You can still grate your soap if your grater has been sitting in the drawer, but it will be a little bit harder (but certainly not impossible). What can you use if you run out of laundry detergent? Make homemade laundry detergent at home and save a ton! If you run out of Tide or whatever you use, just use the above ingredients and make your own. I have a feeling you won’t ever go back to store bought detergent again. This works so well and the savings are significant! You will need a great big container to mix everything in. If your husband has a clean 5 gallon bucket, that would work perfectly. There are only 3 things you need to do to make everything – grate the soap, dump everything in the bucket and mix. That’s it! Once you are done mixing it up, put it into your pretty container and you are good to go. When you are looking for a container for homemade he laundry detergent, be sure to select one that is air tight. I bought my pretty glass jar (it’s about 5 gallon size) at Hobby Lobby when the glassware was 50%. You can also purchase containers on Amazon that are similar. 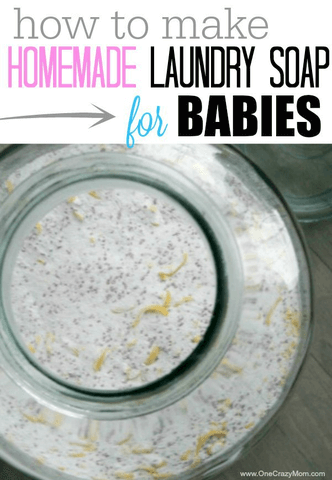 Did you know that his also works great as a Homemade Baby laundry detergent. Don’t wast your money on over prices laundry detergents like Dreft. This Homemade laundry detergent is actually very safe for babies. It is perfect for those with sensitive skin making it perfect for babies too! Are you going to make your own Homemade Washing detergent this weekend? Let us know how it turns out for you. I think you will really love it! It works so good and the savings really add up. You will enjoy having extra room in your budget. I am curious whether or not you have problems with this dissolving in the washer? I have made the simple recipe of borax, washing soda, and the bar soap. However, it left white flakes on our clothes. It may hyst be that our water is too hard for this, but wondering if you or anyone else has difficulty with this? Thanks! No, there shouldn’t be a problem. If you think there will be, you could mix with water before you dump it in your washer. However, we have never had a problem. For the HE washer do you put it in the top tray or do you put it directly into the wash? I noticed this when I used Zote. Zote is actually pretty different than Fels-Naptha. While both will work fine, FN dissolves better and gets out heavy grease and stains better. Zote is great for sensitive skins, lightly soiled loads, and delicates. It is also great for making clothes mosquito repellent as it is made with citronella. I had the same problem but then I dump everything in to my food processor and got it down to power and it works awesome in my HE washer. The best detergent I’ve ever used! Can this be used for HE front loader washers? Do you use the entire box of each and the 3 bars of naphtha? Yes, you use the full box of ALL of the ingredients. It is safe for all HE machines. Just put your clothes in and toss your detergent on top of your clothes before starting your machine. I’m curious if this soap has been ok with sensitive skin little ones. My youngest reacts to every detergent except All Liquid & Dreft. We’ve been using a similar recipe (Borax, Washing Soda & Fels Napths) for a while and she has no problems at all. I toss some Downy crystals in the bottom of the washer for scent & use vinegar-water mix (1:3 ratio) as fabric softener with a ball of aluminum foil in the dryer for static. Works like a charm. Can this be made into a liquid detergent? If so, how much would you use per load? Yes, you can melt it into a liquid, but htat just requires more work. I used this detergent for years and then started making what we call Laundry Goo. It’s the same ingredients only I melt the bar of shredded soap in water then add a cup of Borax and a Cup of Washing Soda. It is a more time consuming process but 3 quarts lasts me 10 months. I don’t have the space for a huge bucket of detergent. I don’t have white stuff left on my clothes this way too. We have hard water. I do use bleach or OxyClean with it. I’ve made these homemade laundry soaps before and while they clean, they do not remove spots. I know the Oxy Clean is supposed to but it doesn’t. I’m not going to spot clean everything before putting it into the laundry (usually don’t even see them when family throws their stuff in). Would you have any other suggestions? I love Charlie’s Laundry soap. I have made batches upon batches of laundry soap. I think I might try yours without the Purex. I have never had an issue with spot removal, but I also pre-treat. Does this work good with cold water washing or does it have to be warm/hot water to dissolve? And does it work for people who have hard water? What size is your container? And does all of the detergent fit in there or do you have to separate it? It is REALLY big… I’ll have to see if I can measure it but it fits it all in there. Just a tip: if you take the grated soap and add the borax and/or washing soda to it in the food processor, it doesn’t make that mashy mush. Also, if you don’t have or can’t find the Fels-Naptha, you can just use Ivory (which is what I’ve been using. Great “recipe”! Thanks for posting the larger quantities! 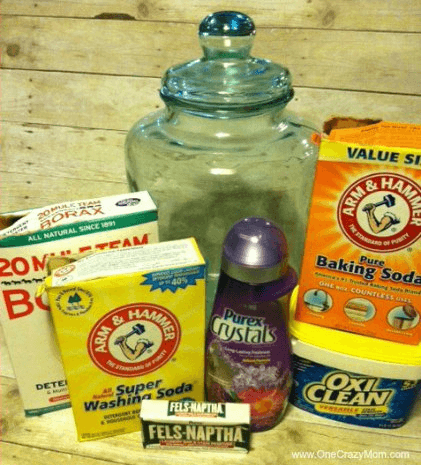 I have a question….. I’ve been making my own and using the 2 TBSP per load, but if you read the washing soda and borax boxes, they tell you to use 1/2c. in addition to your normal washing powder. I can’t quite grasp how if you use that much in addition to normal powder, how in the world 2 TBSP, could be enough. I’ve been using that amount, and while the clothes are clean, I don’t feel like they are as bright as when I was using Tide. Thoughts? Missy, if you feel like it isn’t enough then go ahead and make it 3 tablespoons however that is a lot for my family. It is still going to be ALOT less then the cost of Tide. Also, this laundry soap has many other good things in mixture which is why you don’t have to use as much. Do you just mix the amounts together of the ingredients you listed? Or are there other specific amounts i missed? Thank you! Tiffany – Yes, you just mix these ingredients together. Thank you! I have been making homemade laundry soap for a yr now. I giggle as I pass the laundry section. I also made some up and put in mason jars for family for Christmas! I add essential oil to mine. Usually about fifteen to twenty drops. Smells lovely! Lorena, do you add the essential oils during the time of loading the wash? Or to the actual dry mixture ? I just made this. I bought a $10 2 Galloon Glass container in the kitchen canister aisle. Perfect Size! I already washed my first load and it smells amazing!! However while I was checking out a a man behind me asked if I was making my own laundry soap and cautioned me to no mix the oxiclean in the bucket because it cold explode! I opted to put the oxiclean in last after everything was well mixed and stirred it very slowly just to be safe. Not sure how much of a concern this could be, but i didnt have any issues! I have been doing this for over a year and throwing it all in with no problems. I believe that it will only explode if you are making concentrated liquid detergent. That’s what I use and I have seen a few posts with cautions about adding OxiClean. Hi, I’m currently living with very hard/iron laden water. We’ve been putting vinegar in the rinse cycle to remove the minerals that are in the rinse water. Would you have any other suggestions? Currently running a science experiment every wash–oxi, detergent, and borax in wash, softener and vinegar in rinse. Can’t wait to make this! I read earlier in an article about making your own dishwasher detergent, that you could add salt to that recipe to help with hard water. Maybe you could look into that and see if it’s an option. Can this be used on darks and dress clothes? I cannot find the arm and hammer super washing soap. Any other ideas or can I leave it out or something else to use? They sell it in the laundry aisle of Walmart. Look in the Clorox section with oxi, starch and so forth. In addition to WalMart, check at your local hardware store. I’ve found it at our local Ace/Pleasants Hardware, both in the store & available online. Tammy G. – You may be having a hard time finding the Arm & Hammer if your are looking for washing soap instead of washing soda. If you cannot find the washing soda you can make your own. Just take a box of Arm & Hammer Baking Soda, pour all of it on to a baking sheet. Level it out just a little and stick it in a 400 degree oven for 1 hour. Take it out, let it cool. Be sure to label this as washing soda. Can this be used in cold water or only in hot water? I wash the majority of our family’s clothes in cold water and this works great! I found that if you unwrap the fels-naptha soap, then cut into 3 or 4 pieces and lets them sit out and dry, they shred much easier. No more clumps sticking to the shredder. Becomes a finer powder that disolves in water much easier!! Here a big tip– if you are planning on making this, I would suggest covering your nose with a mask or something. I just made this and when I poured the powders in a container to mix all the fine powder came up in a powder cloud and in my nose. I have been sneezing and nose hasn’t stopped running for a couple hours now. It could be an allergic sinus reaction. Those with sensitive sinus’s should cover them up! A tip I learned from another site is to cut the soap small and put pieces on plate in microwave for 1 to 1 1/2 minute. It grows and looks foamy. Let it cool for about 10 minutes or so. The foam falls into flakes when rolled between your palms..anything that doesn’t look foamy just pop back in microwave for another go. I have a powder dispenser I can load in my front load washer. My question is will the grated soap clog this up? Not only is this worth making because of all the money you save, it cleans better than anything I have ever used. I was always having issues with towels smelling clean and I have not had that problem one time since using this. This not only provides for my washing needs at home but also for my two children at college and it is saving everyone money. My local Wal-Mart has started carrying Zote Flakes. It is equal to 2 bars of Zote soap. I fiqure this would work the same as grating the soap. I was so thrilled to find this. No more grating!! Making this just got easier. I have purchased the 17.6 oz size of zote flakes. Will that equal the 3 bars of soap? Would this work on cloth diapers? I wouldn’t use it on cloth – too many scents, dyes, etc. that would build up and make you need to strip more often. I’ve used the borax by itself on my diapers with a bleach or blue dawn original stripping once a month and it seems acceptable. I usually splurge and get bumgenius cloth diaper detergent though. I have a septic system. I was originally told not to use anything in powdered form but I’m finding things that are in powdered form that are claiming to be safe for septic systems. Do you know if this particular recipe would be ok for a septic system? Also my husband and daughter have sensitive skin. Thoughts on if this would be an ok recipe for that? I so want to do this but definitely have to check with the septic info. I just finished making this & did a load of laundry.. it has no scent? Any suggestion on where I went wrong?? Can I put this detergent in my dispenser of my front loader or no? Has anyone tried Biz in place of the Oxy Clean? I haven’t used this recipe yet but I use biz and I absolutely love it! I’ve had really good luck grating the bars of soap with my food processor. Does the container need to be glass? I just made some! I’m so grateful for you and the things you’ve tested, tried and posted:) You’re Awesome!! Do you have a liquid formula? My front load HE washer’s manual says to not use powdered detergent in it. I made this today and washing the first load now. I usually use liquid and let the washer fill up and get sudsy before putting my clothes in. This doesn’t look any different than water. Should there be at least some suds? It definitely smells clean. Instead of using OxyClean, I use Dirty Jobs. My clothes come out looking beautiful and clean! Hi, I think your recipe is just great, but I have a doubt, mi washing machine has three levels on charge/weight (light, medium, heavy and super heavy-I always use heavy or super heavy-) are you sure that it will be enough with two tablespooons? I was hoping to get the measurements to make this. I only want to make a smaller amount to start. I have one bar of the Fels-Naptha bar. Any help would be appreciated! Made this today..love it! Smells so good! Thank you for the recipe! I do laundry at thelaundromat. can I use this still? I have an HE front load washer. Can I still use this? Or do you have a liquid detergent recipe? Hi! You have probably already bought your ingredients, but wanted to let you know that Amazon charges roughly 3x more for the washing soda and baking soda than Walmart. I just bought a box of washing and baking soda for roughly $3 and $2, plus change. Amazon wad almost $8 for the washing soda. Amazon partners with Sellers and so sometimes they are not the cheapest. I.E. honest company products sell for triple the cost than if you night directly off the website. I love Amazon, but policing of their pricing is a little lacking. Jessica, Try going to Walmart for the ingredients. Some are on the top shelf and others are on the bottom shelf for MUCH LESS than $70+. Do you know of anything that will take pencil lead marks out of whit fabric? I marked a white curtain on the front side by mistake now have pencils marks. I made my first batch of homemade laundry detergent yesterday. I’m washing my first load this morning. My question is the load I’m washing isn’t soapy or foamy. Did i do something wring. Or di i need to add something else to make my washing sudsy. What is the recipe for doing a small batch, using 1 nep bar? Also, my hubby does crossfit so his workout clothes are pretty rancid, will this work on them or does anyone have any suggestions on what to do?!?! I don’t have an HE washer, just a regular one that fills with water. How much would I use? I made a homemade laundry soap recipe a couple of years ago and I ended up using as much as I would if I had a box of Tide. So just wondering what the measurement would be for a full washer of water? I have an old food processor that I use only for this purpose. I put some of the powder mixture in the processor and then chunks of the bars, a little at a time. This way it does not gunk up. How much of the baking soda, oxy clean and purex crystals do you use? I couldn’t seem to find out how much of those I would use. I just made this! I love it already! I’m hoping this will save me a buttload of money! I was able to pick everything up for around 15 dollars!!! I used the dollar tree oxygen stuff instead of oxy clean, works just as well!! Thank you so much! I been making this recipe for a while now…I learned to use 2 Nel Farba soap bars and use the lid on the purex Crystals. I fill up the lid with detergent and clothes are clean. Saves me money and saving money makes me happy. I add the crystals as I wash a load.. just makes it easier for me. This may be a stupid question but do I use 2 Tbsp. in every he load or is that for a “normal” size load. Do I add more for full loads or less for small loads? 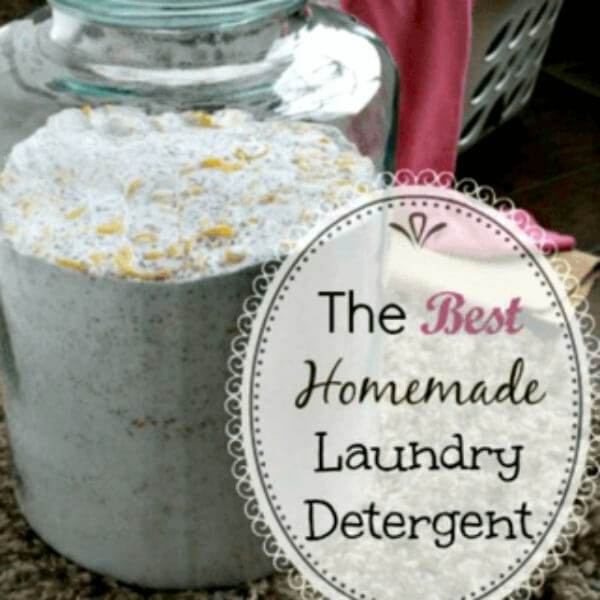 Do you have to use fabric softener with the homemade laundry powder? How much do u use? We just mixed up a batch in an empty Costco laundry detergent bucket and had plenty of room. We couldn’t find the Purex crystals at our store. We bought Downy Unstoppables, but they cost $7, so we’re going to take them back and look for the Purex at Walmart. I just made my first batch of laundry soap. I am super excited to see how it works. I just made a batch and am trying it out on a load of bath towels. By the way.. I just ran out to grab all these ingredients and I found a box of Zote Soap already flaked for this purpose! The box comes with the equivalent of 2 white Zote soap bars, almost the same amount this mix calls for! Such a great find!! Awesome Jenny! That is perfect! I looked over many laundry detergent recipes and yours made more since than any I found. We have many laundry requirements from hand wash delicates to filthy sweaty mowing clothes. Well, I bought everything, mixed it, and washed our clothes. Oh My Goodness!! I just have to tell you it is INCREDIABLE! Thank You!! Is this recipe septic safe?? I live in Louisiana. We wash our clothes in cold water. Will the cold water matter or would we have to do hot water?? We wash our clothes in cold water. Does this matter? Is the 1-2 tablespoons measurement for HE washers only? I don’t have an HE washer, I have an old washer. And I can’t imagine even 3 tablespoons thoroughly cleaning an “extra large” load in my washer. Are you saying that this detergent is so concentrated that I should in fact use WAY less than what I’m used to using? Still excited to make this regardless of how much I need to use! Thanks! yes it will be enough. I was just wondering if this was more gentle on clothes are far as fading? I have used some store soaps and they fade my clothes fast i.e, jeans, black shirts. So I was hoping this mix is gentler on clothes and not worse, if that makes nay sense. Thanks. Yes, it should definitely help with the fading of the clothes. Thanks for stopping by. I can’t wait to hear how it goes for you. Hi! I am a broke veterinary student, so anything that will save me money is very exciting! I want to try this out but I’m wondering if it will fade my nice clothes that I wear to class (we have to dress up at my school). I’ve been a loyal Woolite user for years as it is very gentle on colors but it is incredibly expensive! In addition, how good is it at getting really dirty scrubs/towels clean? I have been making this soap for a couple years, love it. I grate the fels naptha with a salad shooter, makes the job a lot easier. Look for Salad Shooters at Goodwill or rummage sales. Is borax safe? I have been looking for a natural detergent, And I thought borax was not safe for children.. Does anyone have a recipe for a smaller batch? I can use my food processor(Have an old one just for making laundry soap)if I add some of the baking soda to the soap while processing it. Works great! !No sticky mess. Just make sure to have lid on chute as it can put some dust out. I have been making this soap for quite awhile and really love it. I gave my daughters and my son all containers of this for gifts and now they all make it:) my daughters friend used it at her house and took some home next thing I know the girls mother is calling me for the recipe. Quite a few in my family have allergies and sensitive skin and they can ALL use it. I bought some sheets for my grandson and he told his grandpa that his sheets smelt good. For HE do you put in dispenser or on top of clothing? Put it in the barrel of the washer, before adding your clothes. Would one of the big plastic containers my cat litter comes in be okay to store the laundry soap in? I want to make some of this. When I went to price supplies I noticed that our Walmart sells a box of Zote flakes. Are these easier to use than a bar? The box is a 17.6 oz box. How much of the flakes do I use? Would a 2 gallon container work to store detergent or is it to small? don’t you have your baking soda and washing soda amounts turned around? I made a batch of laundry detergent today. I found everything at Walmart.. I went over the 20.00 by about 8 bucks but I am thrilled… My husband the die-hard Tide advocate is also impressed. This detergent cleaned his nasty railroad clothes and with the exception of some oil stains on one of his pant legs, they look nearly brand new. Thank you so much for this post!! We mixed it up this afternoon; used 2-19oz. containers of GAIN instead of PUREX and love the scent. Washed a load of clothes w/ warm water and our whites are WHITE again! Thank you so much for posting this. I have heard that if you put fels naptha in the microwave for a little bit it will expand then when you let it cool it will just fall apart. so it helps with not having to use a grater. is this true? Yes its true!!! But be sure you watch it as it cooks or it will burn and your microwave & kitchen will smell like soap for weeks! Just would like to know what size container I will need to mix this all in??? I am curious about the recipe above, 1 area you say “•(3) Fels-Naptha Bars” then another you say “•Fels-Naptha Laundry Bar Soap (only $.98 per bar and located in the Laundry soap aisle). so is it 1 bar or 3? Does anyone know if it is safe to use bleach with this? I did not put the oxy-clean in, but everything else was by recipe. I always use bleach in my white loads and didn’t know if it would be safe or not. I put the oxi clean in mine and I use bleach on my whites and haven’t had any issues with that. This stuff works great in cold, warm, or hot water. I use it all the time. BTW, this is also very low sudsing so it can also be used in a HD washer. I use cold water to wash my clothes all the time. I made this laundry detergent when I was trying to save my Son’s and Grand children’s laundry after a house flood. All the laundry was mildewed, filthy, and smelled horrid. Took this detergent and all the clothes to the laundry.some clothes had to be washed twice, which was fine. In the end I managed to save all but five pieces, saving my Son at least $2 or $3 Thousand dollars. That was about 4 years ago and I haven’t bought any laundry soap since. I mix this up and am so happy with it, will NOT go back. I have a front loader and was very disappointed in the smell it left on my clothes. I’ve spent tons of money trying to clean the washer Long story short. I’ve been using the homemade laundry detergent not only to save money but because this detergent actually helps keep the washer clean! I haven’t had to use the tide or affresh front loader cleaners.